Durable UV treated half-circle trainer quickly adjust to accommodate any player and any club. Simple to set up. Folds flat for storage. If you have any questions regarding the Half Circle PVC Swing Trainer, please give us a call, we would be happy to help you with any questions you may have. 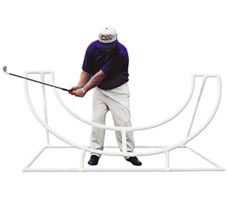 Write an online review on the Half Circle PVC Swing Trainer, and share your thoughts with others.